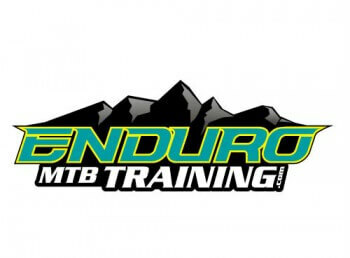 It’s considered the mecca of mountain biking. The massive jumps and root and rock-covered, technical trails are matched by the scenery of the old, misty forest that covers the Northwest for a combination of fun and beauty. If you were given a dollar for every time a new video came out titled “So and so shreds Whistler trails,” well, you’d have a lot of dollars. 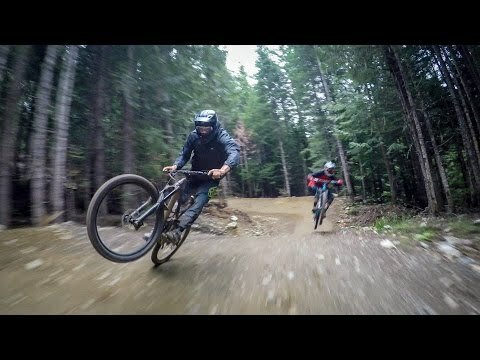 It seems like there’s always something going on in Whistler and the trails are highlighted in countless photos and videos. The next best thing is seeing it for yourself. 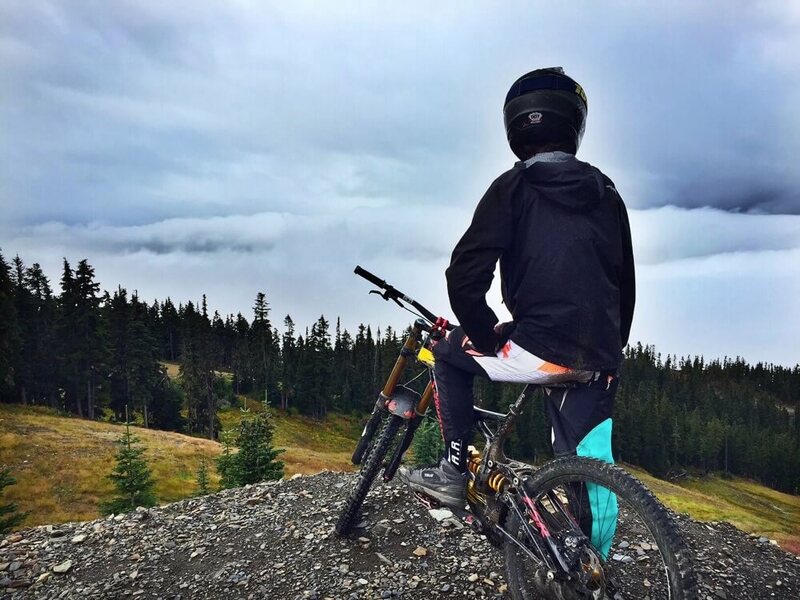 Here are our top recommendations of trails to ride, restaurants to try, places to sleep, and everything else that you need to experience on your next mountain bike vacation in Whistler. 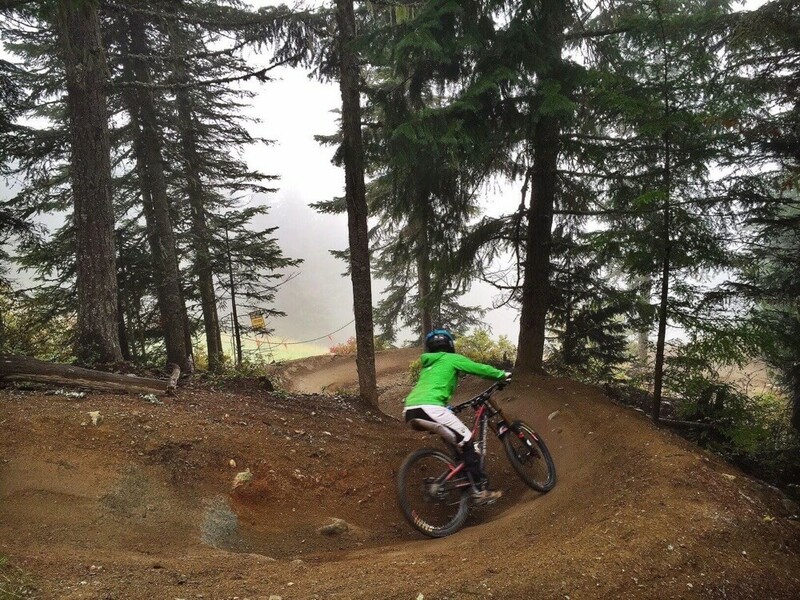 A-Line is synonymous with the Whistler Bike Park. It’s their signature jump trail that capitalizes on smooth berms and fast tabletops. The top section’s jumps are going to push your limits a little more, but that isn’t to say that the lower section’s jumps are going to baby you. Commit to some speed and send it. 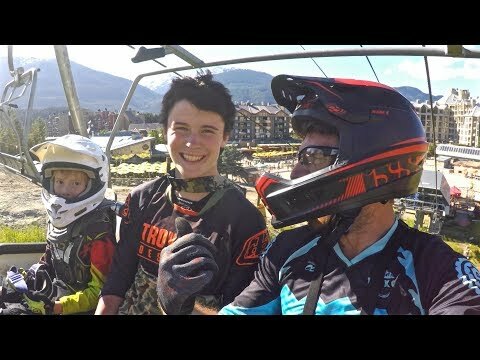 Whistler Bike Park is always a blast, but let’s not forget that there’s an insane number of trails outside. 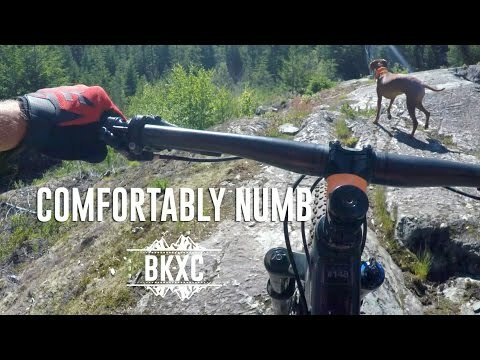 Comfortably Numb is an IMBA epic with 2,000 feet of elevation change, soft, loamy dirt, a little flow and some technical rock slabs also. Your Whistler trip wouldn’t be complete without seeing the single-track that put the place on the map. Danimal has the rooty, rocky technical terrain that you want to be in, with a few doses of wooden ladders and rock slabs for a taste of BC free riding. Crank It Up is another notorious jump trail in the Whistler Bike Park. This one throws in a tad more wood features and some wide-open sections to really fly. Think of it as a warm-up for A-Line. The Four Seasons is the place you want to be when you really want to treat yourself on your BC vacation. As always, the Four Seasons screams luxury, and this one is no different. The Pan Pacific is also an excellent option at the base of Whistler. This hotel has several different room options ranging from studios to two-bedrooms, and also comes with options for bike storage. Down by the base of the Creekside lift at Whistler is the Rimrock Café. They’ve picked up a few awards by serving notable dishes like their Wild BC Salmon, and Venison Steaks. Hy’s also keeps your Whistler vacation top notch by serving the best beef available. Their chefs and servers are experienced in serving you the most savory, juicy steaks in the area. Creekbread keeps the dining experience simple while still using the best local and organic ingredients. Their “Creekbreads” have numerous options for sauces and cheeses and even keep their pepperoni is chemical and nitrate free. Bar Oso specializes in the Spanish influence of wine, tapas, and charcuterie. Stop in for something light, or one of their many wines and handcrafted cocktails. To start a good day in Whistler, you might as well have some of Whistler’s best coffee. They’re a favorite, not only among locals, but anyone who visits. Tapley’s is a casual gathering spot with pizza and beer. They call themselves “the locals’ living room,” and it offers a great place to take a load off and catch a game when you’re in town. Evolution Whistler makes their business run by renting high-quality bikes when you’re in need of one. A downhill bike will run you about $150 CAD and a trail bike will be closer to $80 CAD. The shop prides itself on renting out bikes with quality components that are regularly serviced, ensuring a dependable ride. Known for the customer service and reasonable prices, this local shop is a great option for those who are looking for more affordable rentals. Coastal Culture’s bike rentals range from $70-$100 CAD, and their team’s dedication to helping you find the right trails is unmatched. Cross Country Connection rents out bikes from Specialized and Norco at their Whistler storefront. Rentals include a lock, helmet and protection, and maps. You can rent hourly, and by the half or full day. 20 minutes outside of the heart of Whistler is the Nairn Falls Provincial Park. Nairn Falls is known for its canyon views and glacier blue waterfalls that run through them. There are 94 total campsites here and 60 are reservable, so remember to book ahead. The sites are $22 per night. Squamish Valley Campground is about an hour outside of Whistler, so it’s a bit of a drive, but luckily there is an abundance of trails in Squamish as well. The campground is on the Squamish river, has beautiful beaches and has primitive camping and RV camping as well. If you’re tired of eating out on your trip and need some home-style cooking to save you some cash and calories, stop by the Upper Village Market. The grocery store is within walking distance to the Whistler Village. Sometimes, there’s just nothing comparable to a good book to pass the time when you’re the passenger on a road trip or burning some time at camp. Armchair Books is open 9 am to 9 pm, seven days a week and is down in Whistler Village. Summit Sport is Whistler’s largest rental and tuning shop for both summer and snow sports. Stop in if you need a quick derailleur tune or a new pair of sunglasses or goggles. How will you know what trails are the best for your trip in a place like Whistler, where there are trails on top of themselves and they’re all amazing? Arbutus Routes is an all-encompassing guide company, where $139 will get you a bike rental, water and snacks, and someone who’s qualified to show you the best that Whistler has to offer.